To monitor a model created in third-party tools or in other Pega Platform™ instances, import that model and define its objective in Prediction Studio. uPlusTelco wants to improve the experience of their customer support by predicting the reason for each customer call. To achieve that goal, the data analytics team built a predictive model and want to monitor its performance by capturing actual outcomes and comparing them with the predicted outcomes. Your first task as a data scientist is to upload the model that they want to monitor to Prediction Studio. In Pega Platform™, switch to the DMSample application to use it as the testing environment for this tutorial. For more information, see Switching between applications. In DMSample, create an open ruleset version. For more information, see Creating a ruleset and ruleset version. In the navigation panel of Prediction Studio, click Predictions. In the header of the Predictions work area, click New. In the Create Model dialog box, click Predictive model. In the How do you want to create the model section, click Import PMML. In the Which model do you want to import section, click Choose File, select the downloaded model, and click Open. The expected performance value is used as a benchmark for monitoring the model. For more information, see Metrics for measuring predictive performance. Upload the model by clicking Import. On the predictive model page, click Save. You have imported a PMML model. 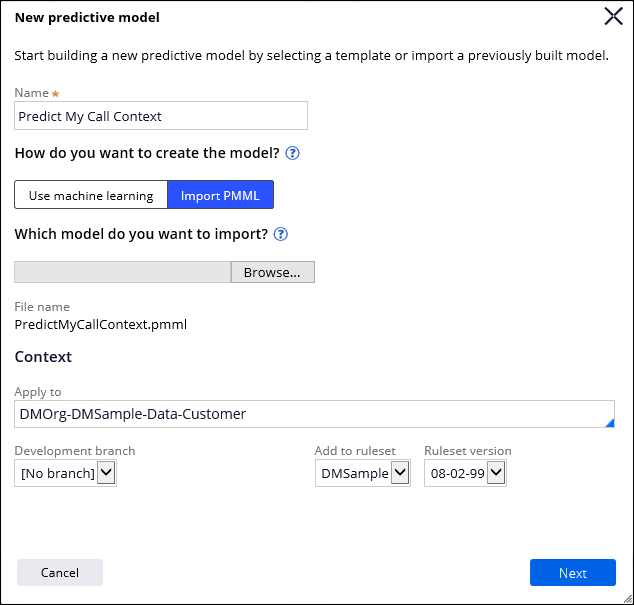 You can now use the model in a strategy to predict customers call the support line. Configure a strategy that references the imported model, and deploy it in a decision data flow. See Creating a strategy for predictive analytics.